The Conway Stewart Dandy Ebonite arrived this morning. I had the luck to purchase it straight from Conway Stewart – they had a special offer on their website – even though it has been out of producion for several years. It is a very handsome, classic pen and I couldn’t believe my luck when I saw the offer. It is a part of what was called the “Ebonite Collection” which is also inscribed at its cap. More photos will come, but I couldn’t resist posting this first snap. Nib size? A beautiful Bold Italic. This entry was posted in conway stewart, fountain pens, pens, photo, writing and tagged conway stewart, fountain pens, pens, photo, writing. Bookmark the permalink. Uh… you did say you were adopting me or somethin’ and one day I’ll have those Dandies, right? You are up to 3 lovely CS Dandies! Awesome. Is it the nib, the look or both? One hopes the nibs are divine! Oh, yes – I’m about to hand in the paperwork on the adoption any day now :D I know – it is a bit crazy with three dandies, but I’ve got all three as very good deals. The ebonite is simply stunning. I particularly like their medium italic nibs – real nice writers. I haven’t decided what I think about the bold italic yet – it has less line variation than the MI and since they switch nibs for a symbolic sum I might go for a switch to a MI instead. It’s a beautiful pen. It actually reminds me most of classic Swans. 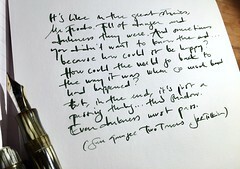 I love chased hard rubber pens, and I think it’s great that some companies still make them – lovely pen, as usual! That’s a beauty. I’m becoming more enamored of ebonite as a pen material myself. Thank you Mona and Bill for kind comments! :D I didn’t believe my eyes when CS sold a few of them now in June They are unfortunately (they sold Dinkies and 58s as well) all gone, but the prices were very competitive – especially considered their price policy the last few years. Great looking pen. Looking forward to your writing samples with it.